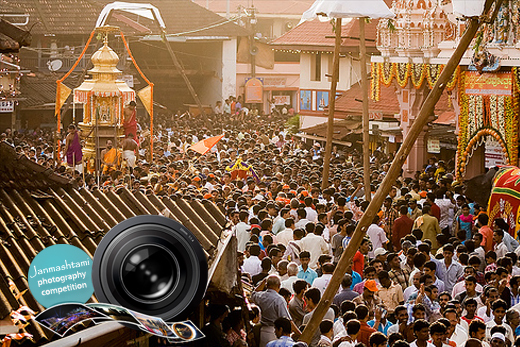 Udupi: Ausugt 28, 2015: The Udupi Press Photographers’ Association (UPPA) and Paryaya Kaniyur Mutt will be organising a State-level photography competition ‘UPPA Moods of Sri Krishna Janmashtami’. A press release issued by the association here said that the participants should send photographs relating to the Sri Krishna Janmashtami and Vittal Pindi festivals to be held in Udupi on September 5 and 6, respectively. There is no entry fee for the competition. A participant can send a maximum of four photographs. The width of the photograph should be 1,800 pixels and its maximum size should be 2 megabyte. The photographs should be emailed: uppaudupi@gmail.com by September 20. Those bagging the first, second and third places, will get cash prizes of Rs. 5,555, Rs. 3,333 and Rs. 2,222. There would be five consolation prizes as well. The decision of the judges would be final, the release added.